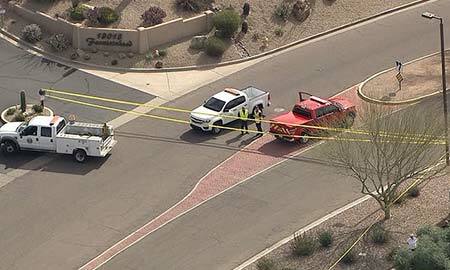 Fountain Hills, Arizona—A third person has died from injuries received in an accident when an SUV jumped a curb in Fountain Hills and struck four pedestrians on Tuesday morning. Two men and two women, believed to be in their 50s and 60s, were standing on the corner of Palisades and Saguaro Boulevards when the tragic accident occurred. Two people died at the scene. One died later at the hospital and the fourth person remains in critical condition. Accident investigators have not released the identities of the dead or injured. Alex Bashaw, age 27, has been identified as the SUV’s driver. According to the Maricopa County Sheriff’s Office, Mr. Bashaw exhibited no signs of impairment. We extend our condolences to the families and friends of those who died, and we wish a speedy and full recovery for the injured victim.